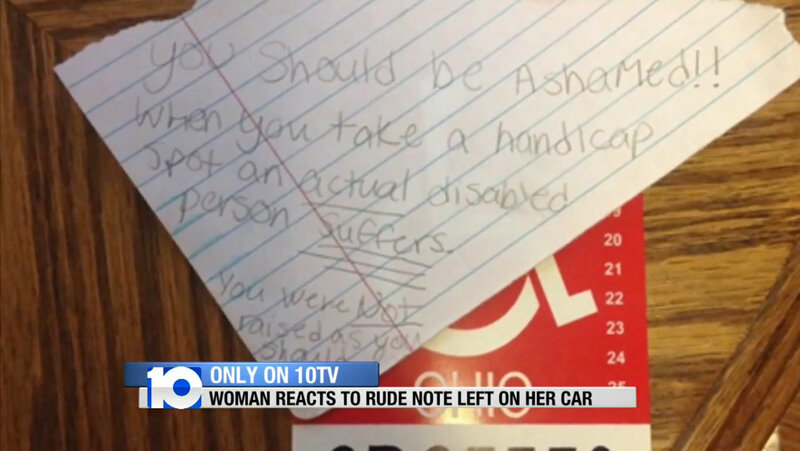 A college student received a terrible note from a stranger who didn’t think she deserved to use her disabled parking permit, and the student’s mom took to social media to defend her. Harley Skorpenske suffers from lupus, an autoimmune disease where the immune system mistakenly attacks healthy body tissue, such as the joints, the skin, the heart and the lungs. It can be painful and debilitating, but those who are stricken with the disease don’t necessarily look sick even though they very much are. Her mom was considerably upset when she heard the news. As Skorpenske was diagnosed when she was just a teenager, her mother has been there by her side as her girl has struggled with debilitating pain, hair loss, hearing loss and the collapse of one of her lungs — three times. She took to social media, hoping to not only possibly reach out to the person who mistakenly shamed Skorpenske for using a placard she needs, but to raise awareness for others who suffer silently. There are so many reasons one might have a need for a placard. Some people have to use a cane or a wheelchair, for example, but others don’t, and that can make folks feel like they have to question someone for using a designated parking space. If you see someone using such a space and they have no placard and no indication on their license plate, then absolutely, question them. But if they do have a sign that indicates they have the legal right and medical need to park there, leave them alone. Yes, some people do use placards meant for family members, but the majority of people who have and use them do not. And yes, children can be afflicted by these same issues — these “invisible” illnesses that can make moving around difficult. One of my daughters does, and although she doesn’t have a need at this time for a placard, she might in the future. I don’t blame this mother a bit for working to share the note and to help other people realize that shaming someone for not looking sick enough is wrong.